Sir Peter Smithers (1913-2006), a real-life James Bond, was the British Acting naval attache for Mexico, Central America and Panama from 1942 to 1946. He spent much of this time in Mexico. An avid amateur photographer (among many other things) he took thousands of transparencies (slides) of Mexico. In 1999, several years before he died, he donated more than 3,000 transparencies taken with his trusty Leica cameras to Mexico’s National Photo Library (Fototeca Nacional). Smithers’ photos of Mexico include some great shots of Paricutín Volcano during its early eruptions (it first burst into life in 1943) and many archaeological and historical sites. 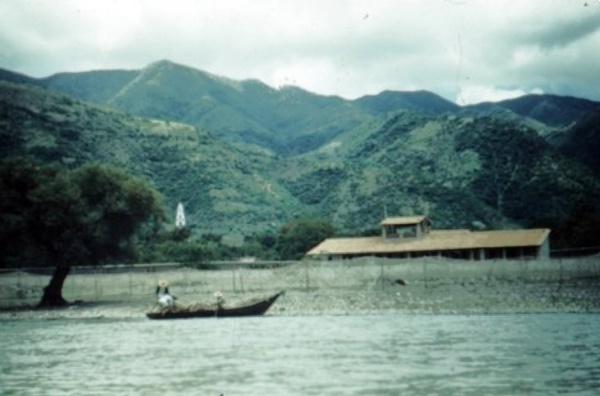 They also include a handful of interesting early color photos of Ajijic and Chapala. Sir Peter Henry Berry Otway Smithers was born in England on 9 December 1913. He attended Harrow and was awarded a Masters degree from Magdalen College, Oxford in 1937. He was a barrister in London for several years and an officer in the Royal Naval Volunteer Reserve from 1937 to 1958. In the early part of the second world war he was interviewed for a position in the Naval Intelligence Division by none other than Commander Ian Fleming. The two men became close friends and it was Fleming who later recommended Smithers to his friends in the diplomatic corps. Smithers is one of several real-life spies alleged to have been the inspiration for Fleming’s James Bond. Fleming gave Smithers a pistol disguised as a pen and used Smithers’s wife’s gold typewriter in Goldfinger. Peter Smithers. Ajijic. ca 1944. Credit: INAH/Fototeca Nacional. In 1940, Smithers was appointed to the British Embassy in Washington D.C. where his tasks including liaising with the U.S. Navy Department and spreading disinformation via the cocktail circuit. In 1942 he was made the British Acting naval attache for Mexico, Central America and Panama. Smithers spent much of his time as naval attache in Mexico, where in 1943 he met Dojean Sayman, originally from St. Louis, Missouri; the couple married a few weeks later and had two daughters. While in Mexico, Smithers pursued another of his lifelong passions – gardening – to create his own garden in Cuernavaca. He was a respected botanist and collected numerous plant specimens in Mexico for British Museum herbarium. He massed a collection of some 2,000 species of cactus at his home in Winchester, England and they accompanied him when he moved to Strasbourg. His interest in photography began as a means of documenting plants but quickly expanded into other subjects. He was encouraged by Claudine Laabs, a leading bird photographer, to exhibit his photos of plants and Smithers held numerous one-person shows of his work in the U.S. and elsewhere. He won many photo awards and was the recipient of the Royal Horticultural Society’s Gold Medal for his plant photography. 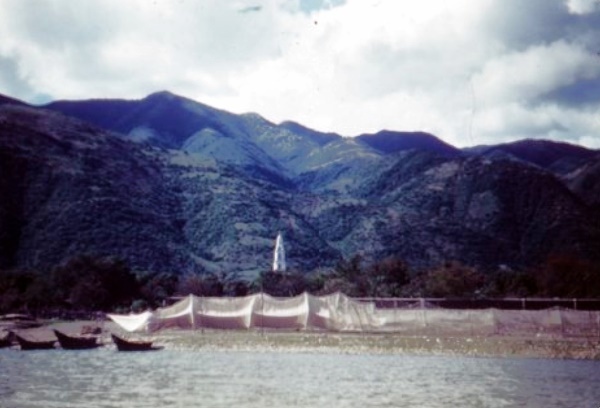 These two photos of Ajijic were taken in about 1944, well before the village spread into the surrounding hills. The upper photo shows a typical local chinchorro (seine net) drying on the beach. Later in life Smithers made series of TV programs on foreign affairs for the BBC, gained a doctorate in history from Oxford (1954) and a doctorate in jurisprudence from the University of Zurich (1970). He was a British parliamentarian for many years and served as Secretary General on the Council of Europe in Strasbourg from 1964 to 1969. Smithers lived the latter part of his life in Switzerland and died on 8 June 2006 in Vico Morcote, Ticino, at the age of 92. M. Stenton and S. Lees (ed). 1981. Who’s Who of British Members of Parliament: Volume IV 1945-1979. The Telegraph (UK). 2006. “Sir Peter Smithers” (obituary). The Telegraph, 10 June 2006. The Financial Times, 14 June 2006. Comments, corrections or additional material related to any of the writers and artists featured in our series of mini-bios are welcomed. Please email us or use the comments feature at the bottom of individual posts.